SHANGHAI -- Zhu Xiaohong closely examines a 4-year-old Volkswagen Touran, using the flashlight on his mobile phone. The gray VW sits in what looks like a multistory parking lot but is in fact the Shanghai Used Car Trade Market, the largest of a cluster of secondhand dealers on the city's Zhongshan North Road. Zhu's conclusion: "I want to buy this car." Zhu, who has bought used cars twice before, said he cannot afford to buy new. But while used cars are significantly cheaper than new ones in China, prices are higher than in developed overseas markets, and there is often greater uncertainty about quality. Yasuhiro Konta, a senior manager responsible for secondhand sales at Dongfeng Nissan Passenger Vehicle, explained that it is rare to see a standard going rate for a used car in China. "Each price is decided by negotiation," he said. This informal system reduces the pressure on sellers to keep prices down, according to Cameron Macqueen, general manager of Southern Cross Warranty, the Chinese arm of Australian financial company Presidian. "Pricing in China is a lot higher than in the U.S. or Australia -- maybe up to 30% or more for some makes and models," Macqueen said. He estimated average secondhand sale prices at 60,000 yuan ($9,770) nationally, but added that the figure rises to 200,000 yuan in big cities such as Shanghai, where top-end luxury cars are popular. China's used car market has expanded alongside a dramatic rise in demand for new cars. Sales of new passenger vehicles hit 17.92 million in 2013, according to Deloitte's 2014 China Auto Finance Report, confirming China's status as the world's largest car market. Bill Russo, managing director of consultancy Gao Feng Advisory, said the supply of used cars is increasing as owners sell into the market rather than handing on vehicles to other family members. Demand, Russo said, is picking up as younger drivers become more comfortable buying preowned. On the other hand, Russo pointed out that the ratio of secondhand sales to new car sales is much lower in China than overseas, suggesting that there is a lot of room for growth. In the U.S., three used cars are sold for every new car purchased, whereas in China only one used vehicle is sold for every four new ones. While those numbers could change, the used car market faces considerable challenges. For a start, growth in new car sales appears to be slowing, although it is still high by Western standards. 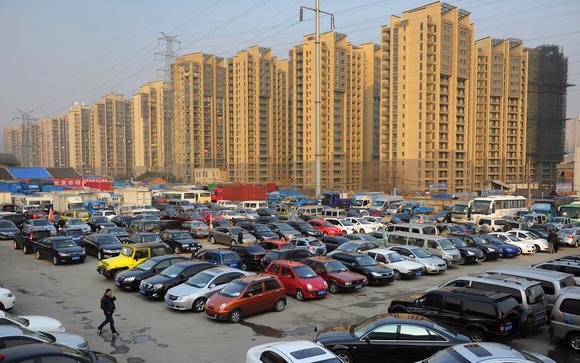 Deloitte, which tracks the industry closely, says it expects annual growth in China's new passenger car sales to fall from 15% in 2013 to 7% over the next few years, with the expansion of the used car market slowing from around 20% a year to 15%. Used car sales are also hampered by a lack of transparent vehicle records, which often makes buying a matter of chance. Sometimes, sellers cross the line into outright fraud. "I would say the majority of cars have their odometer wound back, and therefore credibility issues are rife," Macqueen said. "Chinese are not yet up to speed with how to look after their cars, so it is normal for a customer not to trust the history, the quality, of the car they're looking at, or the dealer." The hit-and-miss nature of the used car market reflects the dominance of independent dealers and brokers. Wang Meimei's corner of the Shanghai Used Car Trade Market is taken up by a BMW, a Mercedes-Benz and a Volkswagen Passat. "Sometimes I sell a car a day, sometimes a car a week. It varies," said Wang, who is preparing to retire after 10 years on Zhongshan North Road. The market is changing, however. Alibaba Group, China's largest e-commerce company, recently announced plans to launch a platform for selling used cars online. Conventional dealers are also beginning to offer warranties on preowned vehicles, prodded by companies such as Southern Cross. New car dealers, known in China as 4S shops, are increasingly moving into the secondhand business, bringing more professional marketing and sales techniques. Martin Kuehl, a spokesman for Audi China, said the company expects the preowned market to continue to grow and has set up 290 licensed used car dealerships -- including 60 that sell only Audis. Dongfeng Nissan began selling used cars at some of its 4S shops five years ago; last year it sold around 20,000 through more than 60 dealers. New government regulations that take effect in October are likely to accelerate the trend toward greater professionalism. Authorized dealerships will be free to sell a range of brands, rather than being tied to a single marque. Industry experts say this will give a further boost to the better-run 4S shops, whose more transparent pricing and marketing practices are likely to put pressure on independents to raise their standards. "I see a trend toward businesses who want to build a brand name -- meaning the quality dealers are getting more and more business," Macqueen said. Some problems will remain, though. Many cities, including Beijing and Shanghai, have implemented measures to try to limit car numbers, usually by restricting the supply of license plates. Many of the cars on sale at Zhongshan North Road carry suburban "Hu C" plates, which do not allow the vehicles to be driven into the city center. Emission standards also vary between cities and provinces, hampering the creation of a national market, or even of large regional markets. When a new Ford Fiesta was introduced to China in 2009, models sold in Beijing and Shanghai were compliant with the fourth-generation national emission standard, equivalent to the European Union's Euro IV standard. Models destined for other parts of the country met only the older China III standard. Today, registering a China III car is difficult nationwide. As a result, those Fiestas are hard to sell.